... 1915 (95 years ago today), "the pioneer Woman Suffragist of the great Northwest," Abigail Scott Duniway (left) died in Oregon 80 years after her birth on a farm in central Illinois. Her family moved West when she was a teenager; her mother and a brother died on the wagon trail journey. (photo credit) She married; when her husband became disabled, she began supporting the family, 1st through schoolteaching, then as a storekeeper. 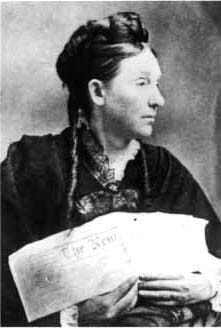 Eventually she moved to Portland and founded a weekly newspaper devoted to women's rights. She also published books, and was a vice president of the National Women's Suffrage Association. In part because of her efforts, in 1912 Oregon became the 7th state in the Union to extend suffrage to women; she became the 1st to register to vote in her county.